The last few days have been consistently mentioning that one should avoid leverage positions ( futures,margin trading ). With the dip of 600-700 points from the top this strategy would have insulated traders. Had discussed about Sensex could take a pause around 18k a few days back. 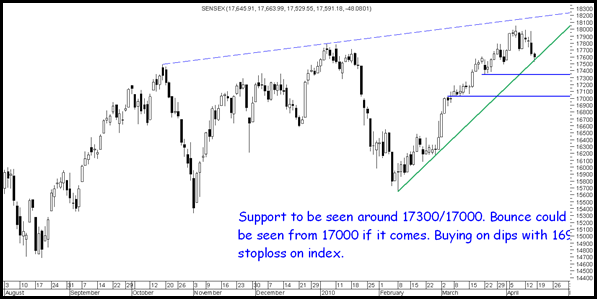 Technically Sensex should see a bounce from either 17300/17000 support levels.The intermediate trend remains positive till 16900 holds. Short term volatility would remain. Buying on dips in the above range could give good returns on the index. Bounce backs would face resistance at 17800. Buy Alembic Ltd around 46-49 with a medium term view tgt 60. Market buzz suggests SREI infra to be bought in dips to 76/70 with 3 months view the stock could do 90. For free intra day trials can add the no on the right side. For getting this blog on e-mail enter your e-mail id in the right top box. I have stuck very badly with 300 IFCI @91, 300 RNRL @146 & 296 RCOM @392 for long time. Can you pls advise?? I dont think so you have many options. Would advise IFCI to average at 48-45 zone with a 3-6 mths tgt 60. 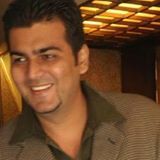 RNRL and RCOM would not advise averaging. Also do look into the portfolio in totality then on stock by stock basis. Goa Carbon you can remain invested the stock would be back to 112-115 in short term where you can look to reduce partial position. Thanks Nooresh… I am really trapped in these 3 stks.. Well, my portfolio contains stks recommended by you on your blog like core projects, dcb, hcl insys, gtl infra in small qty. You can be patient with hope. As i am not so bullish on Rcom, RNRL but very bullish on IFCI in the long run. Rest dcb, core is fine . Hcl infsys u can shift. Many thnks Nooresh. Will do accordingly.